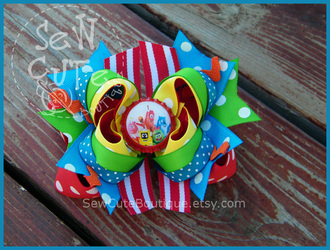 This fun, bright primary colored, layered boutique style bow features a fun bottlecap center. This bow measures approximately 4 1/2" wide, approximately 2" tall and comes mounted to a French barette. If a different style of clip is desired, please specify. 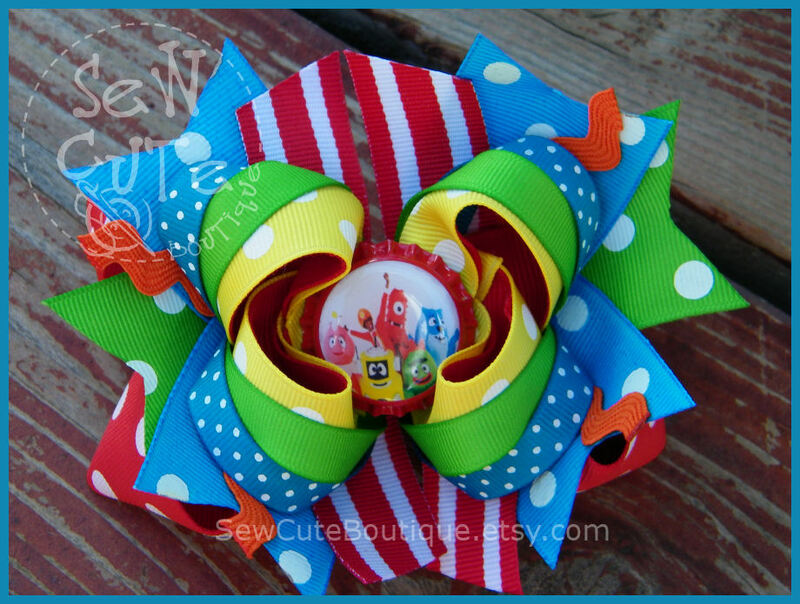 This listing is for one bow. 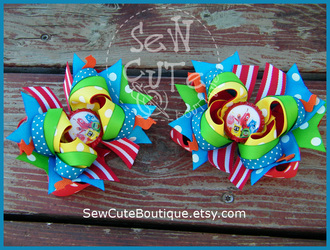 If you desire a pair, please purchase two. 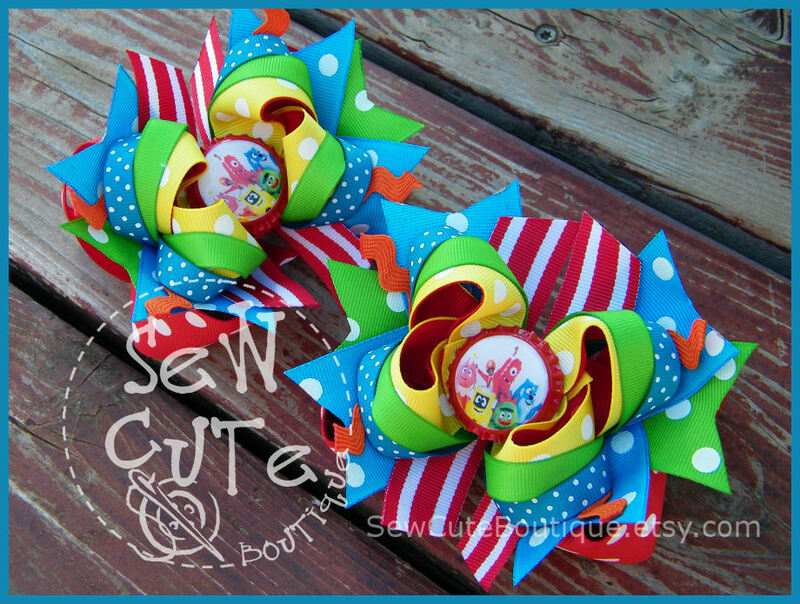 This listing is for the bow only. 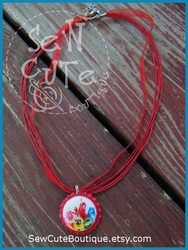 The matching bottlecap necklace shown below can be purchased separately. This is not a licensed Yo Gabba Gabba item. It is a handcrafted item inspired by the popular children's characters. I am not affiliated with or sponsored by RDF Media Group. 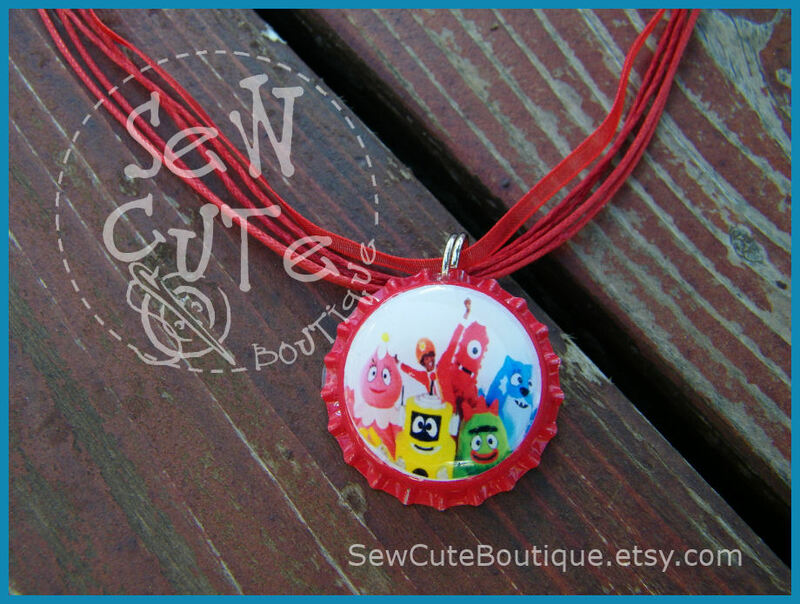 Glossy, sealed bottlecap on a color-coordinated 18" ribbon and cord necklace with clasp closure. 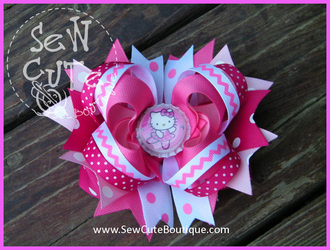 This can be made to match any bottlecap hair bow. Please specify color and/or images desired. 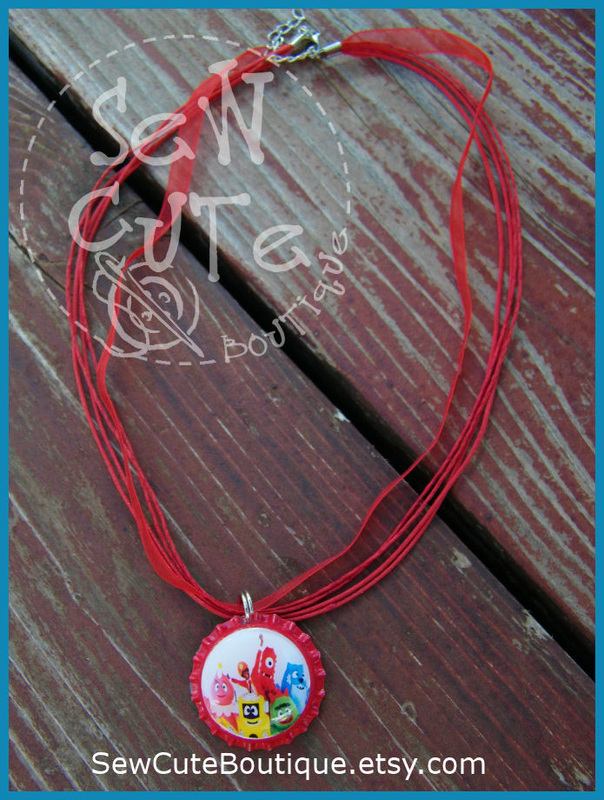 Otherwise I will assume you want the bottlecap necklace as pictured. This fun, bright colored, layered boutique style bow features a fun bottlecap center. This fun, all shades of pink, layered boutique style bow features a fun bottlecap center. 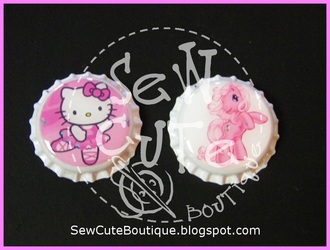 Choose from the bottlecap shown at left or additional choices shown below. Please specify which bottlecap image you want. This is not a licensed item. It is a handcrafted item inspired by the popular children's characters. I am not affiliated with or sponsored by the makers of these characters. 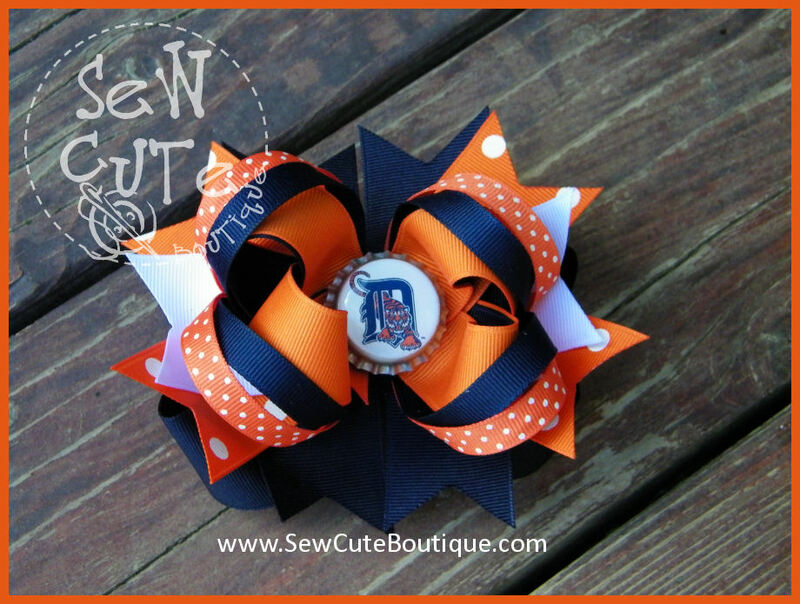 Custom team spirit layered boutique style bottlecap bow. Your bow will be similar to the bow pictured. This bow measures approximately 4 1/2" wide and is attached to a French barrette, unless otherwise specified. Please specify team name, mascot and colors in notes to seller during checkout. 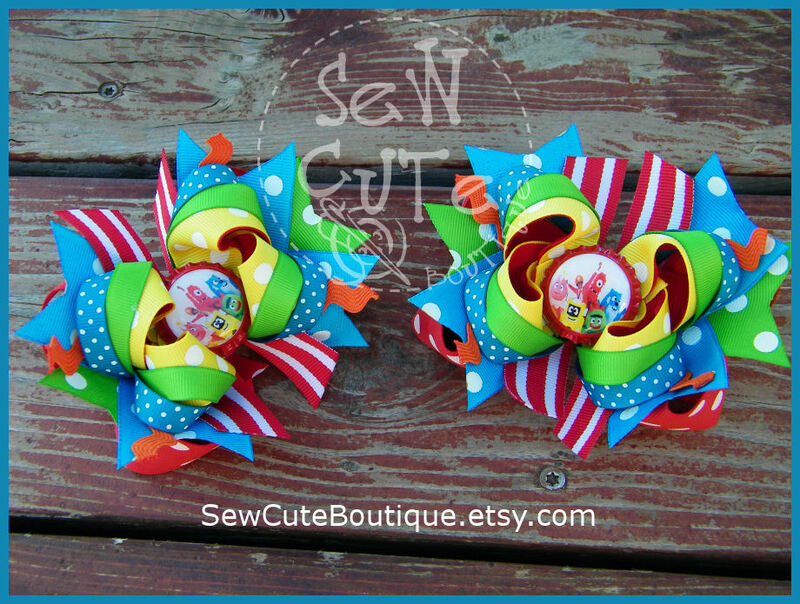 Please allow 2-3 weeks for completion of your custom bow. I may not have all colors of ribbon in stock and may need to special order ribbons to create your custom bow. 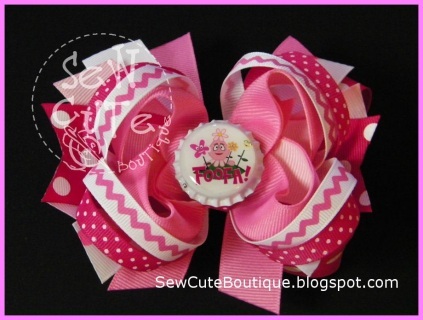 If you need this bow by a certain date, please also give me that information in notes to seller. This is not a licensed item. 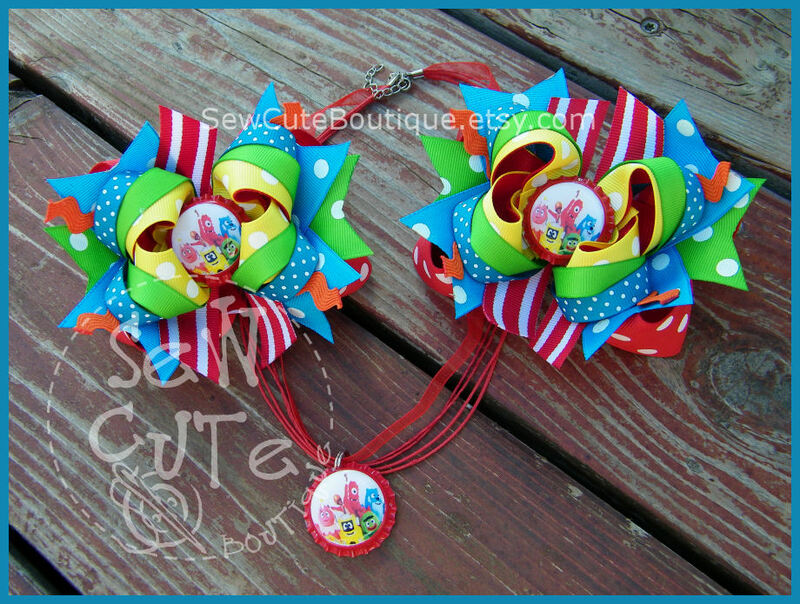 It is a handcrafted item. I am not affiliated with or sponsored by any team. 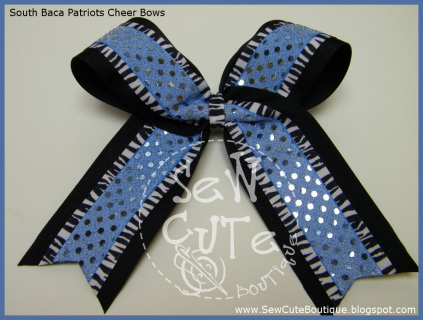 This listing is for a set of six (6) cheer bows. The bottom layer (shown in black here) is 2 1/2" wide ribbon. 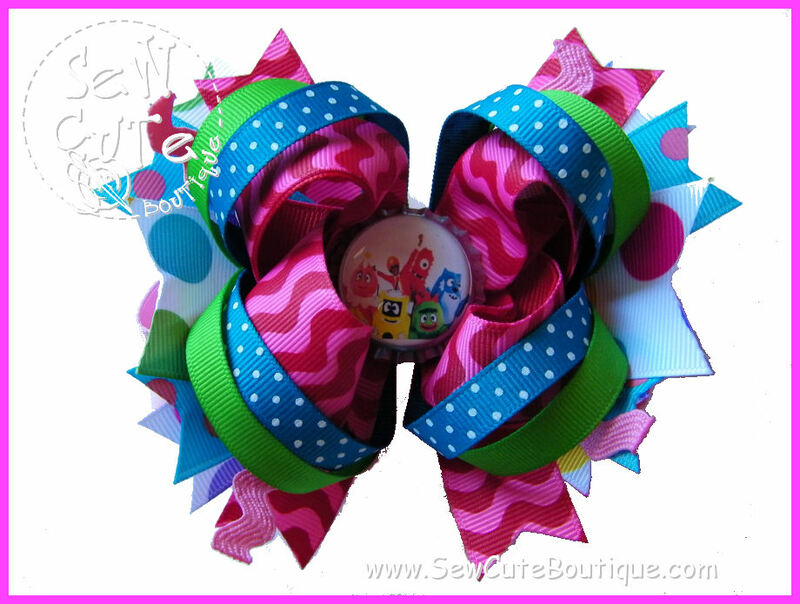 The middle layer (shown in zebra stripe here) is 1 1/2" wide ribbon. The top layer (shown in blue sequins here) is 7/8" wide. All layers are fused together. 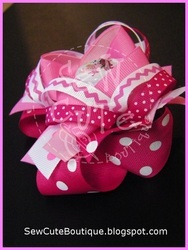 Mounted to your choice of a lined French barette or pony tail band. Please indicate your desired color(s) and placement. 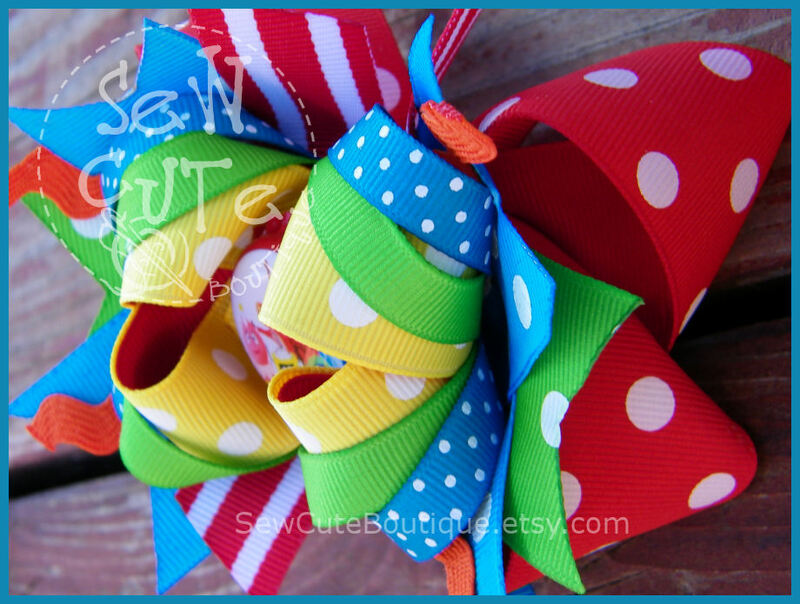 This bow measures approximately 7" wide. 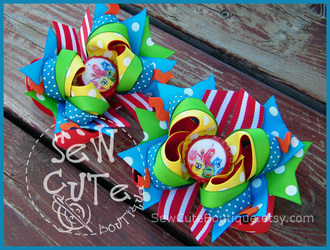 If you are interested in a different size of bow or a larger number of bows, please contact me. PLEASE ALLOW THREE WEEKS FOR THIS ORDER TO BE READY TO SHIP.